There’s been plenty of speculation about the future of Singapore-based Bubbly, the Seqouia-backed startup and its ‘Twitter for voice’ app. But the company is not liquidating, as reports had suggested — instead, today it announced that it has been acquired by Altruist Technologies, an India-based mobile company that specializes in voice services. Altruist intends to use Bubbly, the company’s smartphone app for iOS and Android that has over 40 million registered users, and its SMS-based BubbleTalk (which claims 140 million registered users) services alongside its own one-to-one voice messaging platforms. 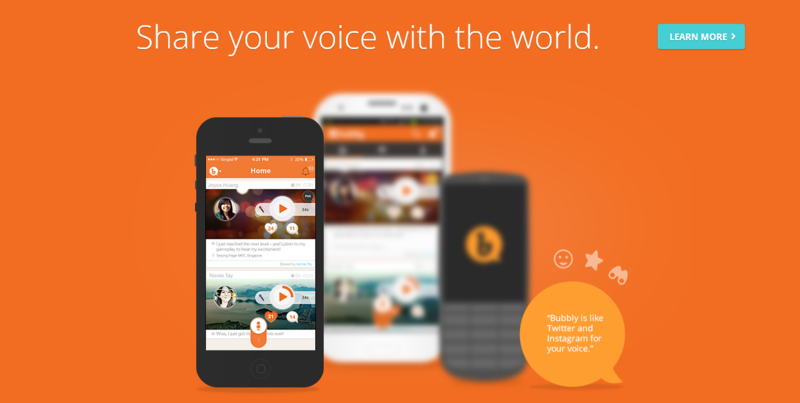 Altruist claims 80 million active voice messaging users across Africa and Europe, which it believes complements Bubbly’s services, which are primarily used in Asia. Following the deal, Bubbly will remain an independent business. There is no plan to integrate the two services on the consumer side, though they will share resources for efficiency. That said, there will be cross-promotions: existing Altruist users may be prompted to download the more social network-like Bubbly, and vice versa. Bubbly, formerly known a Bubble Motion, is one of Southeast Asia’s most notable startups in terms of fundraising. It has raised nearly $40 million, and counts Sequoia Capital, Japan’s JAFCO and operator SingTel’s Innov8 arm among its investors. The deal with Altruist is stock-based, which means that there is technically no valuation attached to it, Bubbly CEO Thomas Clayton and Aggarwal said. Those existing investors, who Clayton described as being “extremely bullish shareholders of Bubbly,” will become minority investors in the combined entity. This exit is perhaps something of an anti-climax for Bubbly, given the growth of mobile messaging apps and social networks across Asia — not to mention its fundraising activities. The company was initially focused on feature phone users, who could use the service to send and receive voice ‘bubbles’ via SMS. It wasn’t until 2012 that it got an iPhone app, while last summer it pivoted away from voice messaging altogether in favor of being a social network featuring celebrities and other exclusive content owners. Arguably that move was too little too late, and this sale to a service companies — for all the synergy between the companies involved — is a sign that, thus far, Bubbly has yet to live up to its potential as a consumer service. Altruist, with its expertise in mobile services and voice, will hope to change that. That said, a finalized deal is better than liquidation for Bubbly and its investors. Clayton admits that the company has had a difficult few months after a number of potential acquisition deals fell through. The deal with Altruist, he says, took just two weeks to conclude — that’s some nine months after he first indicated to us that Bubbly might be sold. Clayton will remain an advisor to Bubbly and Altruist, though he has relocated to the US for “personal reasons.” Based in the Bay Area, he will continue his role with new Southeast Asia-based VC firm Monk’s Hill Ventures and get started on a new project, details of which he is not revealing at this point. Note: Bubbly CEO Tom Clayton is a regular contributor to TNW’s Enterpreneur content channel.